rec. Teatro Real, Madrid, 27 April 2009. DSD. Region 0 (all regions). 16:9 picture. 5.1 surround and 2.0 stereo sound. NTSC. Subtitles in English, French, German, Italian and Spanish. Il Ritorno d’Ulisse recounts the homecoming of Odysseus (Ulysses) many years after the end of the Trojan War, as told by Homer at the end of the Odyssey. It can be a little confusing that Homer uses the Greek names of the gods and that the character whom he names Odysseus is better known by his Latin name Ulysses – Italian Ulisse. Having established that Zeus in Latin is Jupiter or Italian Giove, Poseidon is Neptune or Nettuno, Juno is here Giunone, Pallas Athene in Latin and Italian Minerva, I shall hereafter name the characters as they appear in the opera. Having incurred the wrath of the Sea God, Nettuno, Ulisse is continuously blown off course before Minerva effects his return and persuades Giunone and Giove to allow him to be reunited with his faithful wife Penelope. Penelope has been besieged all these years by her suitors, but has put them off by telling them she will not believe her husband to be dead until she has completed weaving a tapestry; in fact, every night she unpicks the work that she has woven during the day. Monteverdi – I shall refer to the composer throughout as Monteverdi, though in some quarters it is still not firmly established that he composed all the music – would have inherited some of the ambiguity that attached to Odysseus in the Renaissance. In the medieval period Homer was denounced as a liar and, though some Renaissance writers regarded Odysseus’ travels as a metaphor for the Christian soul’s journeying through life, others, like Robert Ascham in The Schoolmaster, denounced the Odyssey as filled with immorality. Something of this dual attitude can be seen in Penelope’s reluctance at the end to believe that this trickster or magician, incantator o mago, as she calls him, can really be her lost husband. José M Irurzun saw this production at the Teatro Real six days before the recording was made and reported on it for MusicWeb International Seen and Heard – see review. He reported that some of the audience departed at the interval and that the final applause was warm but unenthusiastic, an observation which would seem to mirror his own reaction, with praise for William Christie and Les Arts Florissants but a lukewarm appraisal at best for most of the vocalists, with the exception of Cyril Auvity and Xavier Sabata in particular and for Joseph Cornwell, Juan Sancho, Claire Debono, Sonya Yoncheva, Hanna Bayodi-Hirt and Marina Rodriguez-Cusi. The performance seems to have improved in the intervening week; though I share some of my colleague’s reservations, I share even more of his praise. Would I go so far as to make this my prime recommendation, as at least one reviewer has done? Certainly I think that Christie’s musical direction, with a small group of instrumentalists, is preferable to that of Raymond Leppard with a large orchestra on a rival DVD (Arthaus 101 101). There is, however, a rival William Christie DVD to be considered. That earlier recording, of Christie’s Aix-en-Provence production seems no longer to be generally available, though some online dealers still list it. It is, in the main, vocally more secure, as Melanie Eskenazi’s Seen and Heard account of the performance of that production at the London Barbican makes clear – see review, so it’s well worth seeking out, especially as it comes complete on a single (dual-layer) DVD for around £15 in the UK (Virgin 4906129), as opposed to around £23 for the new Dynamic 2-DVD set. It has been a regular visitor to my DVD player since I bought it several years ago. An equally frequent visitor to my CD deck has been the Brilliant Classics set, conducted in 2005 by Sergio Vartolo, generally at a slower pace than Christie, a wonderful bargain typically for less than £10 in the UK. 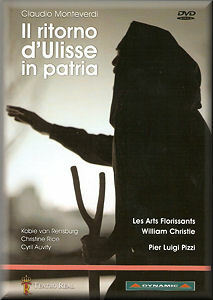 Despite the budget price and a little-known cast, it offers an excellent performance, based on the latest scholarship, as outlined in the luxury 120-page booklet – no cost-cutting there: it’s better than some full-price sets, with learned notes and full libretto and translation (Brilliant Classics 93104). On the whole the Virgin set is better sung than the newer version – even at the very start, Rachid ben Osalam in the minor part of Human Frailty is preferable to Terry Wey on Dynamic. On the new recording Ulisse is sung by Kobie van Rensburg, something of a Sean Connery lookalike. I liked his singing better than José Iruzun, though Krešimir Spicer on Virgin is preferable. The same is true of Christine Rice’s Penelope – outsung by Marijana Mijanovic, though, again, not by so great a margin as to spoil my enjoyment of both recordings. Cyril Auvity, the Telemaco on both recordings, fully deserves JI’s praise. His singing, especially in his duets with Minerva is one of the delights of both sets. Robert Burt is also common to both recordings as Iro: your reaction will depend on how far you can take his mannerisms. I actually thought his performance and singing appropriate on both sets to the character whom Ulisse calls cavaliero panciuto, knight of the paunch. Two scenes expose the singers’ voices in duets. The scene between Giunone and Minerva on the new recording highlights the inequality between Claire Debono’s Minerva and Sonya Yoncheva’s less accomplished Giunone. On the older recording, the two voices are more evenly matched – and I especially liked the way in which the two goddesses are physically separated there for most of this scene by a transparent curtain with prison bars. Olga Pitrach as Minerva is especially most effective – the contrast between her voice and Yoncheva’s would have been even greater had she performed Minerva on the new recording. The final scene between Ulisse and Penelope in which they are gradually reconciled – a duet rather than the usual ensemble finale – comes off well in both versions. As JI writes, Christine Rice’s very adequate Penelope comes to life at this point. If the singing is slightly preferable on the older DVD, I found the presence of other members of Penelope’s court as silent spectators there less effective than seeing the singers alone on the new version. That Aix version is not exactly penny plain, but the newer recording is certainly twopenny coloured by comparison. Sometimes – frequently – elaborate productions can be at the expense of the music. I’ve complained about two such already and I have an even greater offender in my in-tray at the moment, an otherwise enjoyable Dynamic DVD of Handel’s Aci, Galtea e Polifemo in which all the main parts are doubled by emoting actors, for some unfathomable reason – but I didn’t find that to be the case with the Dynamic recording of Ulisse. In the new version a cart is wheeled onto the stage for the Prologue from which a naked Human Soul, L’Umana Fragilità, is decanted to complain of his lot. The same cart then serves as the ship from which Ulisse is washed ashore for Giove and Nettuno to argue over his fate. Giove is accompanied by an attendant bearing an eagle on a staff, which I did think excessive and a little distracting, but not greatly so. When Minerva later appears, her ‘helmet’ is actually just a raised visor, which is also a little disconcerting – what happened to the rest of it? Penelope is fixed to her loom throughout the greater part of the new recording, even in scenes where she doesn’t sing. I found this generally effective, but the fact that there seems to be no cloth in the loom joins Minerva’s helmet as a bit of a distraction. The costumes on the new recording are generally more elaborate than on the earlier version: I thought it especially effective that those of the suitors are virtually indistinguishable and vaguely Spanish in appearance. The differences between the two stagings are most acute in the Contest Scene, where only Ulisse is able to bend his great bow and, having done so, slays Penelope’s suitors. On Dynamic the set briefly flares up and the suitors disappear as the stage is plunged into darkness. As the lights go up, Iro descends, covered in gore, to lament the dead suitors. All this is spectacular without being overstated, but the Virgin recording has an equally effective solution: as Ulisse bends the bow, Minerva takes the arrow and symbolically stabs each of the suitors in turn. Iro (the same singer on both sets) then emerges from a large jar in which he has hidden and delivers his lament. The lack of gore and slightly less impassioned singing are offset by the employment of more dramatic gestures. At the end, the singer comes down and embraces William Christie – a nice touch. If I score the Contest Scene as deuce, there are times when I found the older recording more effective, as when Minerva and Telemaco travel through the air, a visually satisfying effect achieved by nothing more elaborate than a billowing blue sheet. I also liked the effect of Giove appearing like an Eastern potentate on a flying carpet on the Virgin DVD. On both DVDs the picture is good, especially when played on a Blu-ray player with upscaling. The sound is good, too, on both – even better when played via an audio system. The use of two discs on Dynamic means that the very slight motion blur, noticeable at times on the Virgin DVD, is absent. Both sets offer short multi-lingual synopses and subtitles. The synopsis and notes in the Virgin booklet are slightly fuller than the Dynamic. Neither gives the voice types of the characters. What a shame that DVDs never include a libretto when Brilliant can afford to include one in their super-budget-price CD set. The English subtitles on the new recording are idiomatic, though occasionally slightly inaccurate: generoso/generosa means ‘noble’ rather than ‘generous’ and I’m not sure what to make of Ericlea’s ‘a fine silence was never written’ for Bel segreto taciuto tosto scoprir si può (A beautiful secret, though unspoken, can soon be revealed). The Virgin set employs more cues than the new recording, if you think that important. It’s swings and roundabouts, then, which is a shame because I find it impossible to decide which set to keep. In the end, I have to plump by a small margin for the Virgin. You may find that the price differential is a deciding factor, or prefer the rather better vocal contributions on the Virgin set or the enhanced staging on the new Dynamic version. The photographs included with JI’s review – here – may help you to decide if you like the look of the newer recording. If you are happy with a sound recording only, the Brilliant Box offers excellent value.